Make Your Tofu Scramble Taste Like Real Eggs! Kala Namak, or India Black Salt (which is actually pink), is used in Indian cuisine. But it's also used vegan cooking to mimic the taste of real eggs due to its very distinctive sulfurous taste. India Black Salt is actually pink due to its iron content. This is a great find if you are trying to make your tofu scramble not only look like eggs but to give it an authentic egg taste too. To make a tofu scramble, squeeze the water out of a 15 ounce block of extra firm tofu and then crumble it into a bowl. Toss with 1/2 teaspoon of turmeric. and also boosts its anti-inflammatory properties. In a medium saucepan, sauté your favorite veggies in a few teaspoons of extra virgin olive oil. Here I use one half of a green bell pepper, crimini mushrooms, and a little chopped onion. I also like to use artichoke hearts, spinach, shiitake mushrooms, and other veggies in my scrambles. When the veggies are cooked, add the crumbled tofu and season with Kala Namak (about 3/4 teaspoon or to taste) and black pepper to taste. Cook on medium heat, stirring frequently, until heated through and serve! Or, to use this to make an egg salad, replace the salt with Kala Namak in my Eggless Egg Salad Sandwich recipe for more of an egg-like taste. I'm sure you'll come up with your own interesting recipes for this unusual salt. If so, please share them with us! Eating less meat helps sustain our planet. Eat less meat: According to the Sierra Club, "If Americans reduced meat consumption by just 20%, it would be as though we all switched from a sedan to a hybrid." A 2013 United Nations report indicated that animal agriculture is responsible for 15% of global greenhouse gas emissions. Raising animals takes a lot more land and water than raising vegetables. Eating a few less meat meals a week can make a huge difference given Americans average 82 pounds of chicken, 57 pounds of beef, and 46 pounds of pork each year! 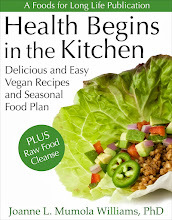 So celebrate Earth Day with a delicious vegan recipe like a Mexican Lasagna or Garbanzo Bean and Raw Kale Salad. I've got a big pot of vegan Split Pea Soup with Carrots on the stove right now. Split pea soup with carrots. 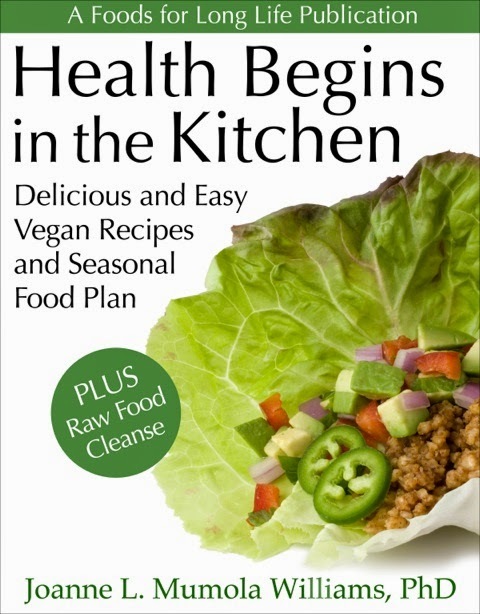 For 160 delicious vegan recipes, download my eBook, Health Begins in the Kitchen. All proceeds from books sold on Earth Day will go to the Luther Burbank Home & Gardens Association. Luther Burbank was a famous horticulturist who introduced more than 800 new varieties of plants, including over 200 varieties of fruits, vegetables, nuts and grains during his career. Plant a garden: Having your own vegetable garden will encourage you to make more plant-rich meals for your family and will save you from driving to the store for groceries. A double savings! Here's how to Build a Raised Bed Vegetable Garden Box. Not convinced? Here's 10 Good Reasons to Plant a Garden. Conserve energy: There are so many ways to save energy. Some are as simple as switching off the lights, taking your bike to work or carpooling, adjusting your thermostat, turning off your computer or unplugging chargers when not in use. Our house and farm are almost completely powered by solar energy. Some states have programs that assist this effort so check it out. It's a wonderful feeling to see the electric meter spinning backwards! Solar panels on our house and barn. 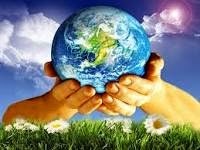 Learn more about Earth Day and how you can participate by going to Earthday.org! Use red pepper aioli to spice up these deviled eggs. It's the day after Easter and if you're looking at a pile of hard boiled eggs and wondering what to do with them, here's a simple and tasty way to use them up. Remember my recipe for Spicy Red Pepper Aioli? Today we're going to use it to spice up those deviled eggs! Carefully remove the shells from your hard boiled eggs by cracking them gently all over and removing the shells. If the shells stick to the eggs, remove the shells under cold water. Cut the peeled eggs in half, remove the yolks, and place them in a bowl. Set the egg halves aside. Using a fork, smash the yolks. Stir in the aioli a tablespoon at a time until the mixture is smooth and reaches the desired consistency. Fill the egg halves, sprinkle with parsley, and serve. Per serving (2 halves): 105 calories, 8 g total fat, 2 g saturated fat, 213 mg cholesterol, 6 g protein, 1 g carbohydrate, 0 mg dietary fiber, and 145 mg sodium. in this simple and delicious Easter cake. When the holidays come, I like to go with a simple dessert, like a cake without icing. It's quick and easy and I get to dress it up with fresh fruit, and a selection of dairy-free ice creams. And what goes together better than coconut and macadamia nuts? Cut the wax paper to fit the bottom of a 9 inch cake pan. Grease the sides with Earth Balance or olive oil. Make flax eggs by mixing the ground flax seeds and water. Beat until gooey and set aside. Place the milk, coconut extract, oil, mashed banana, sugar, and flax eggs in a large mixing bowl. Beat with an electric hand mixer until well combined. Make sure the banana is very ripe. One small banana should yield 1/2 cup of mashed banana. Add the flour, baking soda, baking powder, and salt and beat until well combined. Add the coconut and blend in thoroughly with the beater. Crush the macadamia nuts and fold into the batter. Crush the macadamia nuts with the side of a mallet. Don't overdo - leave big chunks. Bake until a toothpick inserted into the middle comes out clean, about 30 minutes. Place on a rack and cool in the pan for 15 minutes. Flip over onto a plate and slowly peel the wax paper off of the bottom of the cake. Flip back over onto the rack and cool. Place on a serving platter with the golden top up. Slice into 12 or more pieces. Serve with fresh raspberries or other fruit, like pineapple or strawberries, and a scoop of vanilla, or coconut non-dairy ice cream. Per serving (make with unsweetened almond milk): 226 calories, 14 g total fat, 4 g saturated fat, 0 mg cholesterol, 326 mg omega-3 and 760 mg omega-6 fatty acids, 3 g protein, 22 g carbohydrates, 3 g dietary fiber, and 198 mg sodium. Vegan or vegetarian matzo ball soup for Passover. Less than 200 calories per serving! For some reason Jews and Italians seem to live in the same neighborhoods in Brooklyn. At least that was the case in Borough Park and Ocean Parkway, two of the neighborhoods I lived in as a child. I was introduced to matzo balls at an early age and have always loved them. I usually don't think about them until Passover comes around and the shelves in the local supermarkets are stocked with matzo meal which immediately triggers a pavlovian response. 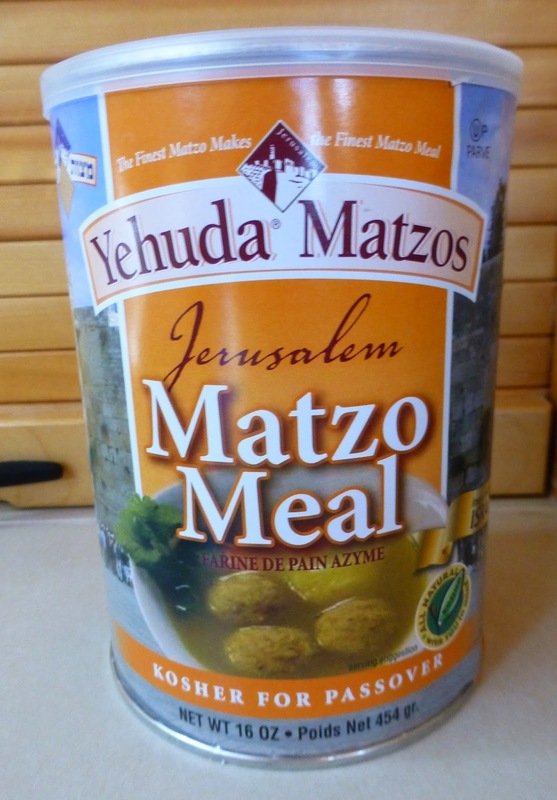 This was the case this week when I bought a big container of matzo meal. I wanted to create a vegan matzo ball for those of you who avoid all animal products. For my readers who enjoy eggs (so many of you raise happy and well cared for chickens), I'll also include a recipe that uses real eggs instead of flax eggs. Nutritionally, the vegan matzo balls have slightly fewer calories, zero cholesterol, 16 times the omega-3 fatty acid, and more the fiber. The vegetarian matzo balls have more protein. With either one, a serving of soup with 3 matzo balls has less than 200 calories. * Instead of veggie broth, you can use 8 cups of water and 1 whole Rapunzel Vegan Bouillon Cube with Herbs. To make the soup, fill a 5-quart Dutch oven or large soup pot with all of the soup ingredients. Set aside. To make the vegan matzo balls, make flax eggs in a medium bowl by mixing the ground flax seeds with 1/2 cup plus 1 tablespoon of room temperature water. Beat until gooey, about a minute. After the "eggs" are nice and gooey, stir in 1/2 cup of water and olive oil. Add the matzo meal, baking powder, salt, black pepper, garlic powder, and dried parsley. Mix until completely combined and let rest for 10 minutes. Meanwhile, bring the soup and veggies to a boil. Let rest for 10 minutes while soup is coming to a boil. Divide the matzo mixture into 18 pieces and roll them into small matzo balls. If they get sticky and hard to handle, wet your hands. Drop the matzo balls into the boiling soup. Lower to a simmer, cover, and cook for 30 minutes. Do not stir or disturb during the soup during this time, other than occasionally peeking in. Per serving of soup with 3 vegan matzo balls: 171 calories, 7 g total fat, 1 g saturated fat, 0 mg cholesterol, 840 mg omega-3 and 694 mg omega-6 fatty acids, 4 g protein, 26 g carbohydrates, 4 g dietary fiber, and 782 mg sodium*. Per serving of soup (using a bouillon cube) with 3 vegetarian matzo balls: 184 calories, 8 g total fat, 2 g saturated fat, 93 mg cholesterol, 58 mg omega-3 and 739 mg omega-6 fatty acids, 6 g protein, 25 g carbohydrates, 3 g dietary fiber, and 732 mg sodium*. * Using a Rapunzel bouillon cube instead of low-sodium veggie broth. Per serving of vegan matzo balls (3 balls): 133 calories, 6 g total fat, 1 g saturated fat, 0 mg cholesterol, 833 mg omega-3 and 648 mg omega-6 fatty acids, 3 g protein, 17.5 g carbohydrates, 2 g dietary fiber, and 218 mg sodium. Per serving of vegetarian matzo balls (3 balls): 146 calories, 7 g total fat, 1 g saturated fat, 93 mg cholesterol, 51 mg omega-3 and 694 mg omega-6 fatty acids, 5 g protein, 16.5 g carbohydrates, 1 g dietary fiber, and 168 mg sodium. Whatever You Call It, It's Yummy! Spring is here and guests will soon be arriving for the Easter holidays. If you are trying to think of easy meals that feed a larger group, this delicious casserole could be it. Since I'm Italian, I can turn anything into a lasagna. This recipe takes beans, rice, corn, my delicious homemade enchilada sauce, daiya pepperjack style shreds, and tortillas and makes a mouth watering healthy Mexican meal for eight people. Homemade enchilada sauce is easy to make! I'm not generally a fan of fake cheese but's what's a lactose-intolerant girl gonna do when she's craving enchilada casserole? 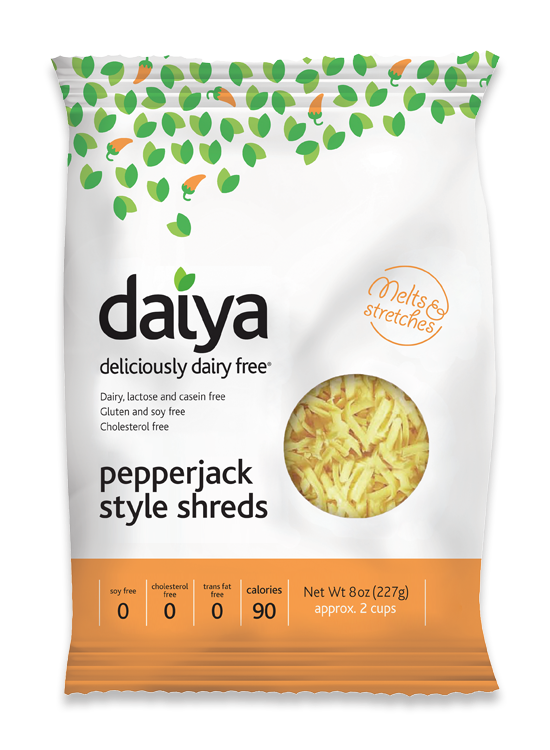 But I must say, of all the one's I've tried, spicy daiya pepperjack style shreds is my favorite. It has a nice little kick to it and adds just the right flavor to this dish. This recipe calls for 1 1/2 cups of cooked rice so if you don't have leftover rice, prepare ahead of time. Heat oil in a 5-quart Dutch oven or large pot and cook the onion and bell pepper on medium-low heat until they begin to soften, about 5 to 8 minutes. Stir in the pinto and black beans, corn, rice, cumin, salt, and cilantro and turn off the heat. To build the casserole, place one cup of the enchilada sauce on the bottom of a 9x11 baking dish. Spread evenly. Cover the bottom of the baking dish with 8 tortilla halves in this manner. Place one half of the bean filling evenly over the tortillas. Sprinkle 1/2 cup of the daiya shreds over the filling and 1 cup of the sauce. Cover with an additional 8 tortilla halves in the same manner as above. Place the rest of the bean filling over the tortillas. Sprinkle another 1/2 cup of "cheese" over the filling and another 1 cup of sauce. Place a final layer of tortillas over the filling and cover with the last cup of enchilada sauce. Cover tightly and bake until heated through, about 40 minutes. Uncover and sprinkle the last 1/2 cup of daiya shreds over the top and heat, uncovered, until melted. About 10 minutes. Cut into 8 slices and serve with diced avocado and vegan sour cream. This delicious enchilada sauce is simple to make! I was making an enchilada casserole for dinner guests last weekend and couldn't seem to find any enchilada sauce in my cabinet. So I thought I'd try to make my own. I was going to attempt my son's famous enchilada sauce but he does everything from scratch and I knew I didn't have the time, patience, or ingredients. But I did have some Regular Chili Powder from Penseys Spices, made from Ancho chili peppers, and some wonderful tomato sauce that I canned from my garden along with a few other ingredients, so I gave it a try. It came out so much better than the stuff you buy in a can. For some reason, most of the store-bought enchilada sauce taste bitter and a little metallic. If you're making enchiladas, I think you'll really like this sauce! This recipe makes a pretty big batch (six cups) so use what you need and freeze the rest. I can't get a solid reading on whether or not enchilada sauce requires a pressure canner or just a hot water bath so to be safe, it's going in the freezer. I like to use Ball's BPA-free plastic freezer cups. Just mark the date and contents on the cups and pop them in the freezer until you need them. 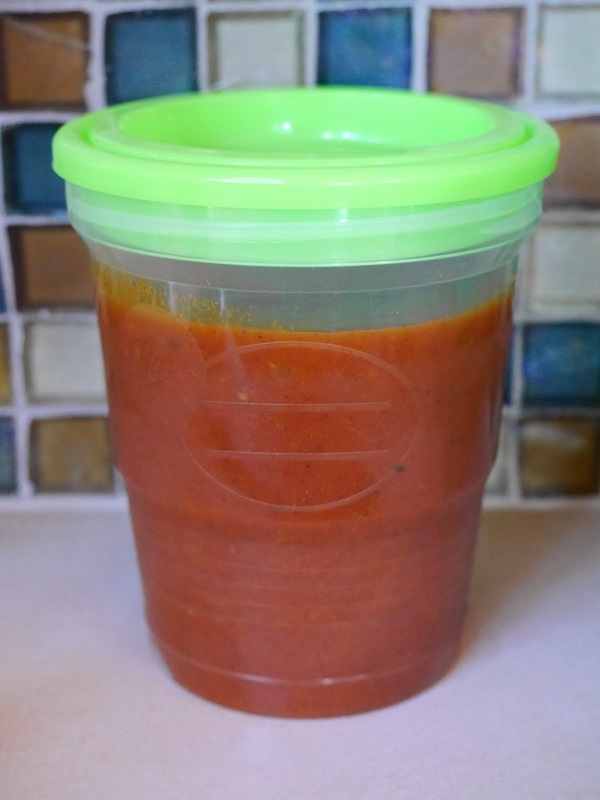 Freeze extra enchilada sauce in Ball freezer cups. * For mild, reduce to 1/4 teaspoon cayenne or less. For hot, increase to 1 teaspoon. Make veggie broth by dissolving an entire Rapunzel bouillon cube in 2 cups of hot water. Set aside. Heat the oil in a 5-quart Dutch oven and cook the onions on medium-low heat until they soften, about 3 minutes. Add the garlic and cook another minute. Add the chili powder, cayenne, cumin, oregano, and salt. Stir the flour into the onion and spice mixture until well combined. After the broth is completely incorporated, stir in the tomato sauce. Blend the sauce until smooth, using an immersion hand blender or a regular blender. Once smooth, use in any recipe that calls for enchilada sauce. Refrigerate or freeze until needed. Per serving: 57 calories, 2 g total fat, 0.5 g saturated fat, 29 mg omega-3 and 331 mg omega-6 fatty acids, 0 mg cholesterol, 0.5 g protein, 10 g carbohydrates, 2.5 g dietary fiber, and 325 mg sodium.